As Obama Taps Cordray Over Warren for CFPB, Retreat From Protection on Mergers Like Capital One's? SOUTH BRONX, July 17 -- On July 21 the Consumer Financial Protection Bureau takes responsibility for complaints against the large banks which caused the global financial meltdown with their murky trade in predatory loans. On July 17 President Obama moved to nominate to head the agency not its founder Elizabeth Warren but former Ohio Attorney General Richard Cordray, who is said to have displayed a lack of commitment to go after large banks, at least when they merge. Back in April Inner City Press covered, and this author was on a three person panel with, Cordray on the topic of the CFPB, including how it is make sure that the consumer complaint information is becomes in charge of is considered when banks apply to regulatory approval for mergers, including review under the Community Reinvestment Act. Cordray dodged the question, finally saying it could be dealt with down the road. By contrast on a conference call Warren answered a question posed by Inner City Press about the relation of the Bureau's complaint data base and CRA review of mergers by the Federal Reserve Board and other regulators by saying this would have to be addressed. Now, will it be? An upcoming example is the proposal by Capital One, the credit card company with a slew of consumer complaints against it including the credit score floor to its Federal Housing Administration lending, to acquire the Internet bank ING Direct for $9 billion and move into the top five owners of US consumers' deposits, according to SNL Financial. While Capital One will not be applying to the CFPB for the required approvals, if the CFPB does not make sure the consumer issues are part of the merger review, things will have gotten worse than before the CFPB was created as part of the Dodd Frank Act. One wonders if these questions will even be raised as Cordray is presented by the White House on July 18, and then for Senate confirmation. Watch this site. WASHINGTON DC, April 15 -- The International Monetary Fund is unabashedly promoting the takeover of small banks by large ones, claiming that its own work in “Emerging Europe” since the financial meltdown shows that communities are better served by large banks, even if based far away or in other countries. IMF European Department Director Antonio Borges told reporters on Friday that Belgium was smart to have pushed Fortis to being acquired by BNP Paribas. He urged more such mergers. Inner City Press asked Borges if the IMF proposed any safeguards at all, given that concerns exist that when a local bank is acquired by one based far away, there will be less reinvestment and accountability. Borges, while calling this an “interesting question,” bragged that the IMF organized a coordinated effort to get large banks to treat communities, particularly in Emerging Europe, fairly, and that this had worked. See IMF transcript, below. Inner City Press began to ask about attempts to encourage or require reinvestment, for example in the UK -- but moderator Simonetta Nardin said there was no time for follow up questions. Meanwhile, Borges took but refused to answer two questions about Portugal, citing an IMF policy against officials working on their own countries, and also claiming that the IMF does not get involved in politics. What -- encouraging bank mergers is not political? Watch this site. Inner City Press: you seem to be saying that bank mergers—small banks being bought by big ones sort of unqualifiedly may be a good thing. In some countries people think that local banks are more accountable, that if you move the assets to a faraway headquarters that there's less responsive. What do you say to that critique and is that something that the IMF takes any account of? 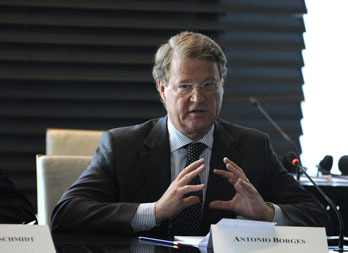 MR. BORGES: you ask a very interesting question, because this is a problem we were faced with over the last few years. In many of the countries of emerging Europe, you find banks that actually are owned by other banks elsewhere and there were concerns that, as there might be problems in the domestic countries of those banks that assets would be pulled out from emerging Europe and they might suffer. And the Fund, the IMF, invested quite a bit of effort to organize a coordinated effort on the part of all these banks to behave in the best possible interests of those economies, and I must say this was quite successful, because as a result, these countries are now recovering very well and their banks are operating well. So, if anything, the experience of emerging Europe demonstrates that having large, solid banks operate in your country may be an important source of stability if things are properly managed. WASHINGTON DC, April 14 -- Minutes after Robert Zoellick touted the World Bank's engagement with civil society in the Arab world, Inner City Press asked him if the Bank has had any contacts with the Libyan Transitional National Council based in Benghazi. No, Zoellick answered, since its founding in 1944 the World Bank can deal “only with established governments.” He went on to describe World Bank assistance to those fleeing Libya, referring to a program with Bangladesh to get its nationals out and provide then assistance once back in Bangladesh. But Bangladesh's Permanent Representative to the UN has told Inner City Press that most of his nationals remained trapped in Libya, unlike for example Belgium which immediately flew its 78 citizens out. Zoellick implied that some part of the $500 million program just announced with Tunisia will help those fleeing Libya to that country. We'll see. Inner City Press also asked Zoellick about Yemen, whether World Bank programs continue there and what it would take to change that -- that is, if there is a limit to the repression that the World Bank would accept. Zoellick replied that nearly all of the World Bank's international staff have been removed from the country for safety reasons, although a “resident” remains to work on “the bank [or Bank?] brief” there. He mused that the World Bank likes to watch things, to be ready. But ready for what? Watch this site.